The old fashioned wand is a good cleaning tool for cleaning lightly soiled carpet. When cleaning more heavily soiled carpet, the wand becomes a ‘beast of burden.’ Cleaning results depend upon the strength, stamina, and technique of the person working the wand. Cleaning heavily soiled carpets with an old fashioned wand is ‘hard labor.’ The repetitive motion of scrubbing back and forth is extremely strenuous and fatiguing. An individual can not scrub long enough to effectively clean your carpets. 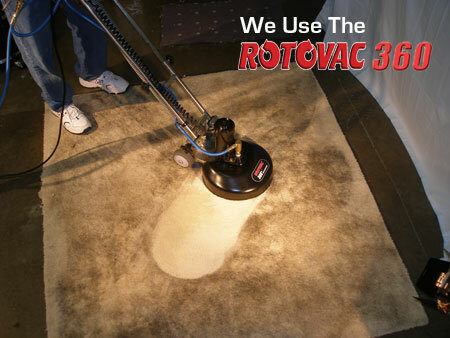 First and foremost the Rotovac is an electric power scrubbing tool. Comparing the Rotovac to an old fashioned wand is like comparing a skill saw to a hand saw. We have converted a back and forth manual task to a much easier and more efficient rotary mechanized operation which makes more cleaning passes per minute than is possible with an old fashioned wand. In addition, the cleaning passes are from all directions rather than just back and forth. This is what produces better cleaning results for you. The Rotovac has a carpet pile height adjustment wheel which allows it to work on most carpeting: installed-over-pad carpet, most commercial glue down and even berber! *We will not move computers, musical instruments, grandfather clocks, beds, china hutches, dressers, anything electrical, bookshelves, entertainment centers, pool tables and items similar…our technicians reserve the right not to move any piece of furniture or household object that they do not feel comfortable moving. Our dry times are typically about 8-10 hours for carpet, furniture is usually much less. Dry times can be affected by many factors including weather, humidity, airflow and the amount of dirt/stains in carpet or furniture (more dirt and stains requires more time steam cleaning an area, therefore more moisture. We can provide you and your family with shoe covers so you can walk on the carpet immediately. Yes, our cleaning producsts are safe for your family and pets. All products used in your home are products that I have used in my home around my children and pets! Yes, having your carpet and furniture cleaned removes pollutants and makes for a more friendly breathing environment. In cases of severe allergies, we offer an exceptional allergy relief treatment. Just the opposite actually!! Dirt acts as an abrasive when trapped in your carpet or fabrics and should be removed to reduce wear. Should I have a protector applied after cleaning? Yes! Most carpet manufacturers recommend that you reapply protector after professional cleaning to restore the original stain resistance. Some manufacturers even require it as part of the warranty on the carpet. Applying protector to your furniture helps keep body oils at the surface to easily vacuum off and if a spill occurs, the protector allows you time to blot up the spill before it soaks into the cushion. Yes, you should remove all knick knack and small breakables from the areas being cleaned. You can walk on your carpet immediately with the shoe covers we provide if desired, but it is recommended that you limit traffic until completely dry. Yes, our technicians have been working with us & our clients for quite awhile and stay current on the latest cleaning techniques. Let me start by defining the difference between a spot and a stain: a spot is any foreign material (soil, liquid, etc.) that is removable by standard cleaning methods. (The foreign material is on or around the carpet fiber) A stain is foreign material (soil, liquid, etc.) on carpet that is not usually removable by standard cleaning methods. (The foreign material has penetrated “soaked into” the fiber and has changed or damaged the fiber itself.) Some stains may be very difficult to remove or permanent. Also, sometimes spots that come back are not actually coming from the carpet —they’re coming from the pad!!! When a spot is removed during the cleaning process and then re-appears in a few days or weeks it could be wicking. Wicking is when something gets into the pad and over time it has no where to go but up and therefore it “wicks” upward. These spots/stains can only be permanently removed by pulling back the carpet, replacing the pad (all or just the affected area) and then cleaning the carpet. Carpet actually acts like a filter trapping pollutants which are then removed by professional carpet cleaning. As long as a regular cleaning schedule is maintained, carpet provides much better indoor air quality than hardwood.